April | 2014 | The Intraracial Colorism Project, Inc. Complexity Magazine is the official magazine of The Intraracial Colorism Project, Inc. Founded in 2013, Complexity Magazine will focus on colorism, diversity, identity, mixed race, multiculturalism, race, social justice, societal issues, and unity. We will publish quality content and explore new perspectives in colorism, diversity, identity, mixed race, multiculturalism, race, social justice, societal issues and unity. Content will include art, articles, essays, poetry, commentaries, interview summaries, book reviews and special thematic issues. We are seeking staff for this start-up magazine that will be published online in a digital format with a special print edition published in 2015. Staff will be expected to attend virtual staff meetings (via Skype or conference call) as needed. Please note that all positions listed below are unpaid at this time. Associate Editor:The editor is in charge of setting editorial policy and is responsible for the editorial content of the magazine. Guides writers, holds weekly virtual meetings with the team designer, photographer, and writers. Responsible for monitoring all stages of content development before publication. Schedules and coordinates the editorial, art and production departments to make sure that the magazine is published on time. Features Assistant Editor: Plans and assigns stories for certain sections/corners of the magazine and may assist in general planning and assignments. The position will work with writers, photographers, designers and illustrators. This position may also be responsible for covering events and writing regular features. Art Director: The Art Director is responsible for the visual appeal of the magazine (photography and illustrations) and supervises the magazine layout. Duties also include setting the design and format of the magazine. Marketing: Responsible for marketing and advertisements in each magazine. Section/Column Writers: Responsible for writing subject matter specific content, conducting interviews, verifying information, writing drafts of articles and coordinating content with other staff. The Politics of Hair in the Black Community. 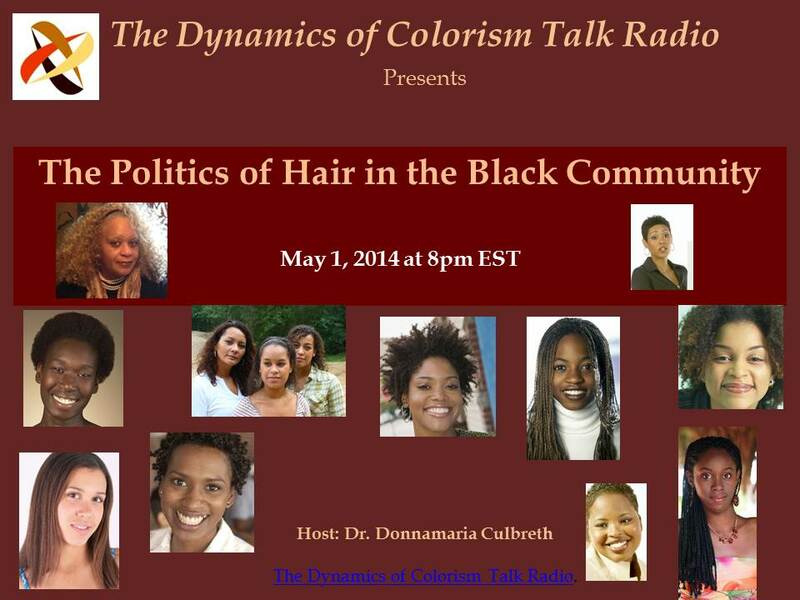 The Dynamics of Colorism Talk Radio will resume shows on Thursday, May 1, 2014 at 8:00 pm EST with the topic ” Colorism and the War on Hair in the Black Community”. I have been extremely busy working on projects but have adjusted my schedule. Looking forward to you listening next week. 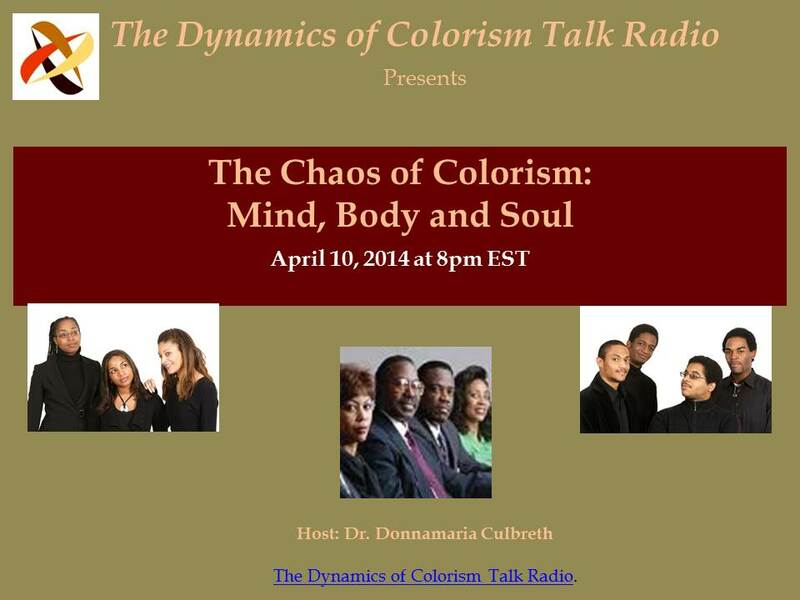 The Chaos of Colorism: Mind, Body and Soul.